Oats are tricky if you have Celiac disease or are gluten-intolerant. Oats are contaminated by wheat during harvesting, with wheat and oats harvested together and transported on the same truck. When we began our gluten-free journey almost 11 years ago there were no certified gluten-free oats, so people made faux-oatmeal cookies using quinoa flakes and other ingredients. Now, however, Bob’s Red Mill, among others, has certified gluten-free oats in every grocery store and health food store (plus on Amazon). Some people with Celiac/gluten-intolerance are also intolerant to the very similar protein found in oats, but my daughters and I aren’t among those. If you haven’t had oats since becoming gluten-free, please be cautious and try just a little to determine if you are sensitive to them. This is a delicious gfcf, gluten free, dairy-free, family-friendly recipe! It can also be (if you double check ingredients!) a wheat free, dairy free, soy free, egg free, corn free, peanut free, fish free, shellfish free, top 8 allergen-free, and vegan/vegetarian recipe. Preheat oven to 350F. Line cookie sheets with parchment paper or silpat. In a stand mixer, cream softened butter and sugars until fluffy. Add water, egg, vanilla to creamed mixture, and beat until well combined. In a separate medium-sized bowl, combine flour and dry ingredients, and whisk together. Add flours to the creamed mixture and stir until just combined. Add oats to the mixer bowl, and again stir until just combined. Don’t over-work. Add the mix-in (we prefer chocolate chips and mini chocolate chips), and fold into the batter. Use a small cookie scoop to scoop out cookies, and set on cookie sheet leaving 1 1/2″ between cookies. Don’t overcrowd or you’ll end up with one giant cookie. Bake for 10-12 minutes, until the edges are just becoming browned. Allow to cool for 5 minutes on cookie sheets, then let the remainder cool on a wire rack. Eat or store in a cookie jar or airtight container until devoured. Once cooled these are sturdy and travel very well in lunches. This pos t includes affiliate links. This recipe is based on Martha Stewart’s Meringue Swirls, mixed with my grandmother’s Snowdrops recipe. Our current oven is the only oven I’ve ever had that made Snowdrops fail. My middle daughter has a subscription to Martha Stewart Living, and tried to make her swirls. It was a mixed bag – she loved the colors, but disliked the orange zest. She also disliked the lack of chocolate, and though there should be more color. After some starts and stops, these rainbow meringues, called Unicorn Poop in our house, were born. As with all meringues, we recommend making these on clear, dry days. Making meringues on humid days will lead to sticky meringues, and nobody likes that. This is a delicious gfcf, gluten free, family-friendly recipe! It can also be (if you double check ingredients!) a wheat free, dairy free, soy free, tree nut free, peanut free, fish free, shellfish free, corn free, and vegetarian recipe. Preheat oven to 200F. Line two cookie sheets with Silpat or parchment paper. Using the metal bowl from your stand mixer, use a regular wire to whisk together egg whites and sugar. Using a paring knife, then split the half of the vanilla bean in half long-ways and scrape the seeds out and into the bowl. They will look like a lot of little black dots. Pour about 2 inches of water into a medium pot, and put that over medium heat. Put your metal stand mixer bowl on top of the pot of hot water (as if using it as a double boiler) and whisk together for a couple minutes, until the sugar is dissolved and the mixture begins to get warm. Return the stand mixer bowl to the stand mixer, and use the whisk attachment to begin beating the eggs. Add the salt and Cream of Tartar to the egg mixture. Continue to beat for about 5 minutes, until it’s glossy and forms a stiff peak (a good test is when you lift the top of the stand mixer – if the meringue holds it’s shape, it’s at the right consistency). Use a silicone spoonula to fold in the mini chocolate chips. Prep a gallon sized zip top bag to make the meringues. Using a small paint brush dipped in the food coloring, paint stripes up the sides of the bag. Next, scoop the meringue mixture into the zip-top bag, and seal the top. Clip the end off one corner of the bag, and pipe small swirls onto the lined cookie sheet. Leave an inch and a half or so between each swirl. If using, sprinkle the sparkly sugar on top of the swirls now, before going into the oven. Bake at 200F for an hour and 15 minutes to an hour and a half. Start checking at an hour and 15, and see if the meringue is hard. If not, leave it in for a little longer. Due to oven differences and humidity levels, sometimes the meringues won’t be hard at an hour and a half, in which case, keep it in a little longer until they are. Store in an airtight container for a week or two, if they last that long. Joe Froggers are a traditional ginger molasses cookie from my hometown of Marblehead, Massachusetts. Joe Froggers were made, originally, by Lucretia, the wife of “Black Joe” and served along with rum out of their tavern. 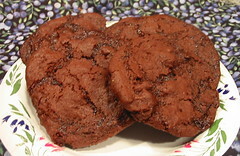 Originally, these cookies were made with rum as well as molasses. I have just turned one of the traditional recipes into a gluten-free cookie. It’s already dairy-free and egg-free, so it’s a delicious, allergy-safe cookie. As you bake it, you can make them crisp or soft. I love them soft, but others prefer them crisp. This is a delicious gfcf, gluten free, family-friendly recipe! It can also be (if you double check ingredients!) a wheat free, dairy free, soy free, egg free, tree nut free, peanut free, fish free, shellfish free, corn free, top 8 allergen free, and vegan/vegetarian recipe. Using a stand mixer, cream the shortening and butter. Once it’s creamed, mix in the molasses. In a medium sized bowl, combine flour through ginger. Whisk it together so it’s well combined. Alternate adding flour mixture and water into the creamed sugar in the mixer. Scrape down the sides of the bowl periodically as you add to the mixture. Pat the mixture into a ball, cover in plastic wrap, and chill for an hour. Preheat oven to 350F and either grease cookie sheets or use Silpat, parchment paper, or Reynold’s Release foil. Using a medium cookie scoop, scoop out balls of dough and place on cookie sheet. Leave 1/2-1 inch of room between cookies, as these spread. Sprinkle a little sugar onto each cookie, and pat it down so it’s flattened a bit. Bake at 350F for 8-12 minutes. Some people like their Joe Froggers hard, and some like them soft and chewy. The longer they cook, the harder they will be. I like them soft, so as soon as they are slightly browned on the edges, I take them out of the oven. Let cool for 5 minutes on baking sheets, then transfer to cooling racks. Joe Froggers are delicate at first, but become very sturdy once they have cooled. This recipe is based off one in the June/July 2012 issue of Taste of Home. I’ve tweaked it to make it gluten-free, and tweaked it to work best for our family. My kids have served these to a lot of people (including selling them at a lemonade stand), and they’ve been happily devoured. No one ever seems to notice they’re gluten-free, allergy-friendly, or special in any way other than being delicious. I knew this recipe was our go-to recipe when my oldest asked me to make a double batch for her camp. She and my middle daughter were the only ones there who were gf, and these were devoured. My middle daughter even complained that she couldn’t have seconds because everyone ate them so fast! This is a delicious gfcf, gluten free, family-friendly recipe! It can also be (if you double check ingredients!) a wheat free, dairy free, soy free, tree nut free, peanut free, fish free, shellfish free, corn free, and vegetarian recipe. It could be made egg-free, but I have not yet tested it with egg replacer. Using a stand mixer, cream together the butter and the two sugars until it becomes light and almost fluffy. Beat in eggs, one at a time, and vanilla. In a separate bowl combine flours through salt. Whisk together to make sure it is well combined. Add the flour mixture to the creamed sugar until combined. Add the three types of chocolate chips, stir until just combined. Cover with plastic wrap and refrigerate for at least 1 hour, preferably more than 2. Using a medium cookie scoop, scoop dough, then drop scoops onto prepared cookie sheets and pat down a bit. Leave at least an inch between cookies to accommodate spread. I can usually get 8 cookies per sheet. Don’t try to put too many on one sheet, or you’ll end up with one giant cookie. This recipe tends to make 30 large cookies. Bake at 400F for 10-12 minutes, until just turning golden brown. Let cool for 5 minutes on cookie sheet, then transfer to the cooling racks. Enjoy immediately, or pack in a lunch. 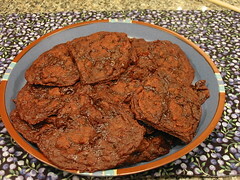 One of my friends on Facebook posted her variation of the Chewy Chocolate Raspberry Cookies in Veganomicon: The Ultimate Vegan Cookbook. This is my adaptation of her adaptation. I’ve now made this with 3 types of preserves – Lingonberry, blueberry, and raspberry (a special sneaky batch while the berry-allergic child was out of the house). Of the three, I have to say that the Lingonberry preserve version was the best, hands down. We used the preserves from Ikea, but you can buy 2 brands of lingonberry preserves them through Amazon if you don’t find any in the international section of your grocery store. This is a wonderfully easy and adaptable recipe, so I’m sure I’ll be trying more flavors soon! This is a delicious gfcf, gluten free, family-friendly recipe! It is also (if you double check ingredients!) a wheat free, dairy free, soy free, egg free, tree nut free, peanut free, fish free, shellfish free, top 8 allergen free, and vegan/vegetarian recipe. 1 1/4 cup GF flour (my current favorite is sorghum, but millet, bean, pea, or brown rice would also work well) Reserve the 1/4 cup, that might not be needed. Note: each brand and variation of preserves/jam is different. 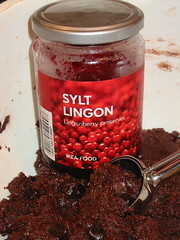 Just as we need to add more sugar if using lingonberry preserves, sometimes more flour is needed when the preserves are quite liquidy, and sometimes a bit more sugar is needed if the preserves are tart. Be patient with this recipe, as the results are well worth it! Preheat oven to 350, and line a cookie sheet with silpat, Reynolds non-stick foil or parchment paper. Or you could grease a cookie sheet, if you don’t have any of the above. In a large bowl (or the bowl of your stand mixer), stir together preserves of choice, sugar, oil/melted margarine & vanilla in one bowl. Set aside. Slowly add dry ingredients to wet ingredients, mixing well with a whisk or fork between additions (or using the paddle of your stand mixer). If the dough becomes quite stiff, doing the final integration of the flour with clean hands works very well. If the dough does not become stiff, add the reserved 1/4 cup flour and incorporate it into the dough. 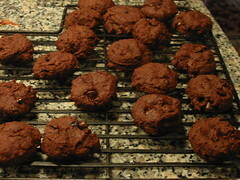 Mix in the chocolate chips after the wet and dry ingredients are well combined. Remove from the oven and let cool on the cookie sheet for 5 minutes, then transfer to cooling rack to let them cool completely. Eat and enjoy! These are a favorite holiday cookie from my childhood, my Nana made them every year. I was so sad when we went dairy-free, as it was then impossible to find dairy-free mini chocolate chips. Thank goodness for Enjoy Life chocolate chips! You can also make them with regular sized chocolate chips, but they are even yummier with the mini chips. I am hopeless with meringues – they always end up sticky, but these appear to be foolproof. You should still try to avoid baking them on wet days, but otherwise they are incredibly easy and keep very well in an airtight container. These cookies are gfcf, wheat, gluten, dairy, soy, corn, tree nut, peanut, fish, and shellfish free. and delicious! Preheat oven to 370 degrees F. This is NOT a typo! Beat the egg whites with an electric mixer. Sloooowly add the sugar, vanilla, and salt to the eggs. Continue to beat eggs until they form stiff peaks. Line two cookie sheets with parchment paper, Reynolds Release, or silpat . Drop teaspoonfuls of batter onto the sheets. You want small, snowdrops. They still work if they end up larger because you have “help” from children, though. Leave them there overnight (ideally), or for at least 5 hours. I do it overnight, as otherwise I would be tempted to check on them. Put a sticky note on the oven to remind people that they may not open the oven. Take them off the cookie sheets in the morning and place in an airtight container. Give as many as survive your hungry family to your most loved friends and family. Adapted from my friend Sue’s tried-and-true recipe, but adapted to be gf/df/sf/and rolling-out-free. These are divine. This is a delicious gfcf, gluten free, family-friendly recipe! It is also (if you double check ingredients!) a wheat free, dairy free, soy free, potentially egg free, tree nut free, peanut free, fish free, shellfish free, top 8 allergen free, and potentially vegan recipe. 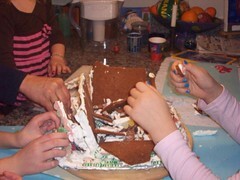 This recipe also makes a beautiful and delicious gingerbread house! Line cookie sheets with exopat, silpat, or parchment paper. Mix cookie ingredients together in the order listed, until it forms a great big lovely soft ball of dough. Using a cookie scoop (or a spoon, I suppose), scoop out balls of dough. Roll in powdered sugar, and squish onto cookie sheet. leave about an inch around, as they spread. Bake for about 6 – 9 minutes. When they’re done, they’ll be a little crinkly on top, but won’t change color much since the dough is already brown. Let cool on sheet about 5 min, then cool the rest of the way on a cooling rack. I didn’t have the patience/time to scoop individual cookies, so I adapted my peanut butter cookie recipe into bars. cream peanut butter, oil, sugar together. add eggs. mix in flour, xg, salt, baking powder. mix until well combined. add chocolate chips. mix until just combined. press into a greased 9×13 pan (I coat with Reynolds Release foil or just greased foil). Bake at 350 for 30 min. wait for them to cool, and cut. yum! This is one of our all time favorites, because this is a super-easy, super-adaptable recipe. It doubles quite well, too. If you can’t use peanuts, other nut and seed butters work fine. And if you can’t do eggs, egg substitutes have worked well here too. This recipe is gluten & dairy free and can be corn & soy free. 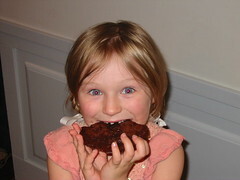 I have made these as brownies as well. Preheat oven to 350. Grease cookie sheet or line with parchment paper or silpat. Use a stand mixer or strong arm and medium sized bowl to cream peanut butter and sugar and egg together. Add salt & baking soda. Mix until well combined. Add the chocolate chips, and mix well. Use a cookie-scoop or tablespoon to scoop small balls of dough out. Flatten on the cookie sheet. The dough is not really easy to handle, but it will taste great once it’s cooked. Bake for 10-12 minutes until puffy and golden brown. Let sit on the sheet for a few minutes before (carefully!) removing to cool. These cookies are delicate at first, but as they cool they become more sturdy. yum. This one is adapted from a recipe by Joanne Fluke. Cream fat and sugar. Beat in egg replacers. Mix in vanilla. In a separate bowl, whisk together baking powder through xanthan gum. Add flour mix slowly until combined. Add chocolate chips and mix until just combined. Dough will be stiff and a bit crumbly. Drain cherries and reserve the juice (when I’m really good I use the cherry juice instead of water for the egg replacer). In the microwave combine the chocolate chips and the coconut milk. Heat in 30 second intervals and stir until just melted. Add about 2 TBS cherry juice. You want the chocolate mixture to spoon easily – you might need a little more or less juice. Use a cookie scooper or pat dough into walnut-sized balls with your fingers. Place on parchment paper/silpat covered cookie sheets (12-13/sheet). Press down center with thumb to make a deep indentation. Put cherry in the little hole. Spoon chocolate sauce over cherries – make sure not to drip it down the sides. Bake at 350 for 10-12 minutes. Let cool on cookie sheet a couple minutes, then move to cooling rack. If you’re feeling really decadent, drizzle with more chocolate sauce after baking. These are simply amazing. And no one will ever guess that they are “special”. In fact, my grandmother (who dislikes “special” foods) asked for the recipe!